"To be one with the night," said the poet Gunnar Ekelöf "one with the crowds of flowers leaning out of darkness to listen to something I had on my tongue to say but never got said." Two sisters aim to get this chance, this moment together. Emilie is an extrovert, a New York photographer, and Ines is her polar opposite. They drifted apart in their adult years and Emilie is trying to pull them back together again with a mystery, luxury trip she is paying for deep in Eastern Europe. Ines agrees to go, yet comes to regret her decision when Emilie insists upon confronting their shared past and altering their future. This deep meditation on life and mortality explores the nature of honesty and trust. It encourages us to live authentic lives, keep an open perspective and release internalized feelings. 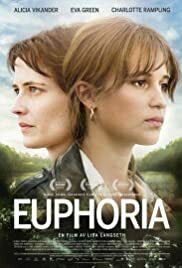 Actors Eva Green and Alicia Vikander are amazing, as is the supporting cast. I immensely enjoyed the classic introvert and extrovert clash. Even though it is a Swedish film, the actors speak English throughout. The soundtrack could have been better. Seen at the Toronto International Film Festival. 36 of 58 people found this review helpful. Was this review helpful to you?